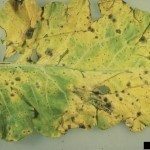 If your favorite cole crops, like broccoli and cabbage, come down with a case of downy mildew, you may lose your harvest, or at least see it greatly reduced. Downy mildew of cole vegetables is a fungal infection, but there are steps you can take to prevent it, manage it, and treat it. Downy mildew can affect any cole vegetable, besides broccoli and cabbage, such as Brussels sprouts, kale, collard greens, kohlrabi, and cauliflower. It is caused by a fungus, Peronospora parasitica. The fungus may start an infection during any point in a plant’s life cycle. Cole crops with downy mildew will show symptoms beginning with irregular yellow patches on leaves. These will then change to a light brown color. Under the right conditions, fluffy white fungus will start to grow on the undersides of leaves. This is the origin of the name downy mildew. Cabbage, cauliflower, and broccoli may develop dark spots as well. Severe infections in young plants can kill them. Conditions that favor cole crop downy mildew are moist and cool. An important way to prevent the disease is to manage moisture. Plant these vegetables with enough space between them to allow for air flow and for them to dry out between watering. Avoid overwatering and overhead watering. The spores of the fungus overwinter in plant debris, so good garden hygiene practices can help prevent infections. Clean up and destroy old plant debris each year. The main times for infection are in the spring on seedlings and in the fall on mature plants, so be especially cautious about moisture and keeping debris out of the garden during these times. You can also treat downy mildew with fungicides, which may be necessary to save damaged seedlings. 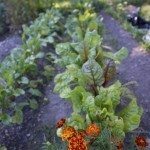 Copper sprays are available for organic gardening, but there are also several other fungicides that can be applied to treat downy mildew. Most will successfully control the infection if applied as directed.